"Secure enterprise content within your organization"
How do you secure the enterprise content management process? Files stored on the Enterprise Content Management (ECM) platforms are not easily accessible by users from outside of the office as ECM platforms typically require a VPN, and a public cloud solution. Making this content accessible to users across devices presents challenges for most enterprise organizations. IT departments need a solution to make ECM and cloud storage available securely to users, no matter where or when the work is being done. When developing an enterprise content management system, you should firstly have to focus on its security. This whitepaper briefs about the requirements to provide secure access to ECM platforms and cloud storage services, and how to best enable productivity for the workforce. • Is your organization able to provide secure access to all your stored enterprise content from any device? • Is protecting and managing sensitive content the top priority for your enterprise content management systems? • How Well Does Your Enterprise Content Management System Protect Sensitive Information? 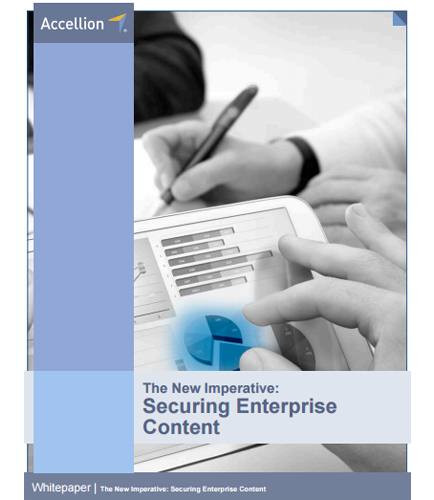 Read this white paper to learn about securing enterprise content within your organization. Information Security or InfoSec is the practice of protecting electronic data or information from unauthorized access. It is maintained by a set of strategies to manage the processes and tools to document, detect, prevent and counter threats to confidential digital information. These objectives ensure that data is protected in all of its forms and private information is not disclosed to unauthorized parties and grant access to the data when required to specific users.